Mary Card is a graduate of both Queen’s University and the University of Toronto and has an exemplary teaching career that spans 42 years. Mary is currently the Curriculum Leader of Mathematics at Riverdale Collegiate Institute, in Toronto. She previously was the Curriculum Leader of Mathematics, Sciences, Health and Physical Education, Business Studies, at Monarch Park Collegiate, in Toronto, where she was known as the Scholarship Lady*, for her relentless pursuit of scholarships, honours, and awards for her students. – 2010 Ontario Volunteer Service Award. Mary has a long history of involvement in extracurricular activities including her role as the staff advisor for the TIGP Seniors in Cyberspace program from 2001 to 2010 and the staff advisor for the newly formed Riverdale Intergenerational Club. She is a Director on the Executive of the TEAMS (Toronto Educators Association for Mathematics) Chapter of the Ontario Association for Mathematics Education. Currently Mary is the President and Chair of the Scholarship Committee of the Fred Hammond, Chapter 73, Quarter Century Wireless Association. She is also a published Mathematics author. Mary volunteers with and has been a member of the Toronto Intergenerational Partnerships in Community Board of Directors since June of 2005. She was the President of the Board of Directors of TIGP from June of 2006 to June of 2011 and she has been the Past President since June of 2011. Mary has also volunteered in the community supporting the Toronto Commandery Hospice, the Multiple Sclerosis Society, and the Terry Fox Run. She has many hobbies which include photography, music, genealogy, antique wooden boats, amateur radio, swimming, biking, walking, hiking, skiing, boating, travelling, coin collecting, stamp collecting, playing “cards”, especially bridge and Euchre, and trying to win a game of Crokinole. She also loves spending time with and helping her special friends of all ages and caring for her four year old blue Betta fish, DesCartes. *IN THE NEWS, Queen’s Gazette, November 17, 2003, p. 5. 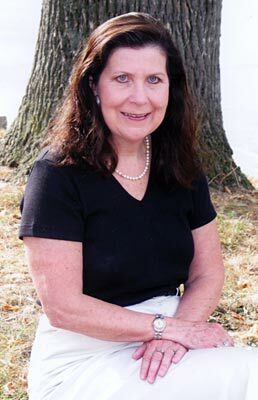 Article: “The Scholarship Lady” wins this year’s 2003 Alumni Achievement Award.